The latest commission to leave the workshop is this pair of six-wheelers. To date, these constitute the oldest rolling stock I have had the pleasure of modelling. 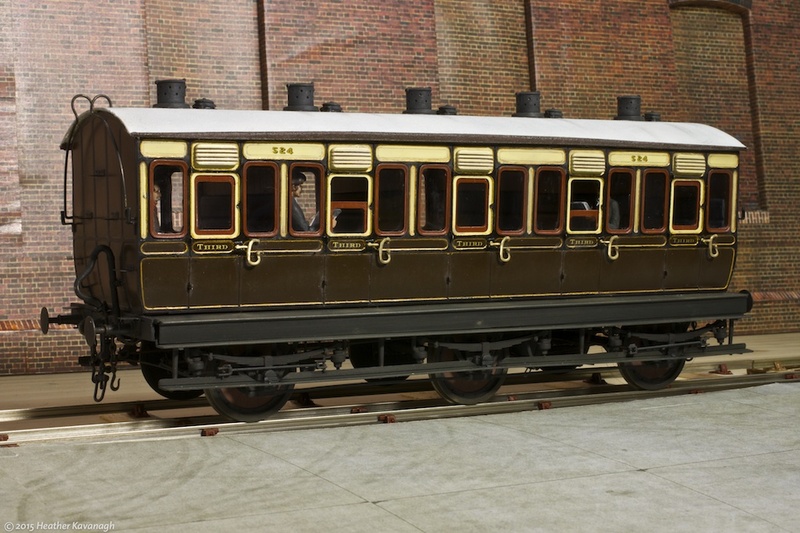 While the kits are relatively modern—the passenger coach kit is dated to 1985!—the real vehicles would have been in service in the late 1880s, on secondary and branch line services of the Great Western Railway. Also of interest, in that geeky model railway kind of way, is these are models of broad gauge rolling stock. Isambard Kingdom Brunel, renowned engineer of the Great Western Railway and many other engineering triumphs of the Victorian era, insisted that his railway would eschew the “cart gauge” used by the Northern engineers such as George Stephenson in favour of a track gauge of 7ft 0-1/4in, to give smoother running. So-called standard gauge, still used to this day in the UK and around the world, is 4ft 8-1/2in. The broad gauge was in use on much of the GWR system, including absorbed lines. The so-called “Gauge War” was effectively lost to the standard gauge in the early 1860s, and the GWR began to lay standard gauge lines and build standard gauge locos and stock. The last broad gauge train ran in May 1892. All the broad gauge stock and locomotives were dumped in a field outside Swindon—the engineering hub of the railway—to be either broken up for scrap or possibly rebuilt to the narrower gauge. This luggage van was built in the 1870s. While it has a guard’s compartment and lookouts, it is not a true brake van as later vehicles were, with no means for the guard to apply the vacuum brake from his compartment. Like many coaches of the period, it retains features from the earlier days of railway travel. Oil lamps for lighting, and a “dog box” at the far end where passengers’ canine companions could travel without mucking up the passenger accommodation. Originally built with only a hand braking system, many coaches were updated with automatic vacuum brakes during their service lives. 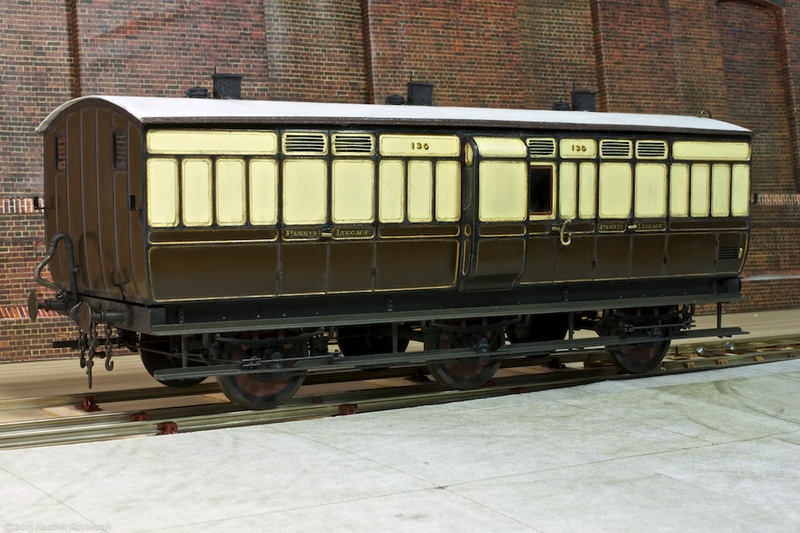 This model, and companion coach, is built to a scale of 7mm to the foot, and has been painted to represent the van as it would have been towards the end of its life. This third class passenger coach is one of the more unusual aspects of the later broad gauge railway. Realising that eventually the broad gauge would end, and indeed with much of the network already being built to the standard gauge, or at least dual gauge, the GWR embarked on building coaches with standard gauge bodies but on broad gauge underframes. When the end of the broad gauge arrived, the plan was to take the coaches into the works and swap the bodies to narrow underframes, thereby prolonging their service life. Again, oil lamps light the compartments, though many coaches were later converted to gas lighting, and the automatic vacuum braking was added at some point during their service. All in all, this has been an interesting commission for me. I have an interest in many aspects of railways, and I like to learn about the earlier history of what is probably the greatest invention of the Victorian age, but I’ve never actually wanted to make models of the period. With someone willing to pay me to build, I was always up for the challenge. Part of the fun, if you like, is the limited resources available to confirm details. The modeller is often left to their own devices, making educated guesses based on various known facts. There has been much head-scratching, a modicum of swearing, and a good deal of assistance involved in this build. The end results have turned out nicely, but there are features I wish I had done better. I’ll know next time: the client has ordered another three coaches, so there is ample opportunity for me to try and get it right next time! During the build I have had copious help, freely given, from various modellers and historians of the GWR broad gauge era. Knowing I have more to come, I have accepted that the only sensible thing to do was to join the Broad Gauge Society. At least I can then access more information directly, rather than beg, borrow and plead! With the workbench clear of Victorian oddities for a while, I am concentrating on the builds that had to be postponed in order to deliver this pair. Back to the mid-20th century for me!